22. TAARIK-UL-SALTANAT, AUHODUDDIN GHAUS-UL-AALAM, MAHBOOB-E-YAZDANI, MAKHDOOM SULTAN MEER SYED ASHRAF JAHANGIR SIMNAI QUDS SARAh NOORANI Rahmat-ul-Allah Alaihe..
Syed Ibrahim Noor Bakshi (رحمتہ اللہ علیہ) was the father of Sultan Syed Asharaf Jahangir Simnani (رحمتہ اللہ علیہ). He was the king of Simnan, where he ruled with utmost Justice and sincerity for 20 years. He was not only a king , but a proficient scholor of theology, and inwardly inclined to mysticism. (Tasuvvf) He respected Islamic savants and patronized Islamic institutions. That is why in his regime, twelve thousand students were gaining education in different institutions. He often met mystics (Sufia) of his time and gained mystical knowledge. He got constructed a Khanquah (an abode for holy men) of Hazrat Shaikh Hasan Sakkak (رحمتہ اللہ علیہ) and shrine of Imame Azam (رحمتہ اللہ علیہ).He was deeply fond of studying books particularly Tarikhe Tibri was in his regular study. Hazrat Nazame Yamani (رحمتہ اللہ علیہ) in Lataefe ashrafi, has mentioned that Hazrat Makhdoom Simnani (رحمتہ اللہ علیہ) used to say that twelve thousand Islamic institutions were functioning in his father’s regime. 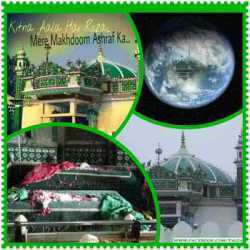 Bibi Khadija Begum (رحمتہ اللہ علیہ) was the mother of Syed Makhdoom Ashraf Simnani (رحمتہ اللہ علیہ). She belonged to the dynasty of Khwaja Ahmed Yeswi (رحمتہ اللہ علیہ) who was a distinguished Sufi (Mystic) of his time and founder of Yewaisia order. She was brought up in a neat and pure religious surroundings as result of which she was deeply religious minded, pious and godly. She passed most of his time in prayer and recitation of the holy Qurran. She often observed fasting in day and woke up at night to be engrossed in prayer. She was very very punctual to Tahajjud (Prayer said after midnight ) In short, Khadija Begam (رحمتہ اللہ علیہ) was the trustworthy of spiritual trusts of her ancestors. His father, Sultan Ibrahim (رحمتہ اللہ علیہ) married with Bibi Khadija Begam (رحمتہ اللہ علیہ) at the age of twenty five years. He had only two or three daughters and no son, After the birth of daughters, there was no issue up to eight years. He was grieved at heart. One morning, he and his wife Bibi Khadija Begum (رحمتہ اللہ علیہ) were sitting together on Musallah (Carper for saying prayer) All of a sudden Hazrat Ibrahim Mazzoob (رحمتہ اللہ علیہ) entered in to the palace. Both were astonished to see him. Hazrat Sultan Ibrahim (رحمتہ اللہ علیہ) stood up and went forward to greet him. He made him sit on the throne and both husband and wife were standing bending their heads before him . Seeing such a noble courtesy meted out to him, he said “ Probably you are desirous of son ”. Hearing it both were extremely glad and said, “ It will be our good luck if you bestow a son ”Ibrahim Mazzoob (رحمتہ اللہ علیہ) again said, “It's price is very much as I will give you an extra ordinary thing” . Sultan Ibrahim (رحمتہ اللہ علیہ) readily said, “whatever you order, I am ready to fulfill it .” Ibrahim Mazzoob (رحمتہ اللہ علیہ) said, “I want one thousand Dinar.” Sultan Ibrahim (رحمتہ اللہ علیہ) presented one thoudand dinar before him. Ibrahim, Mazzoob (رحمتہ اللہ علیہ) stood up happily and said, “O Ibrahim (To Himself) you gave hawk (baz) to Sultan Ibrahim and he bought it cheap. ” Hazrat Sultan Ibrahim (رحمتہ اللہ علیہ) went forward with him as a respect. Turning back, Ibrahim Mazzoob (رحمتہ اللہ علیہ) saw him and said, “ What do you want more; you have got your son.” It is also narrated that one night Hazrat Mohammad Mustafa (صلى الله عليه وسلم) came in his dream and predicted that a Waliullah (Friend of Allah) was to be born in his house; His name will be Syed Ashraf.